Westfield Health is a not for profit health insurance company formed almost a century ago. The company helps people access and pay for health treatment. Through their charitable donations, they support the NHS and medically related charities to help their customers and the community lead a healthier life. Westfield Health is an award-winning health care provider and currently has over 400,000 policy holders. In 2014 Westfield Health purchased a new building and undertook a substantial project of refurbishment work to create a new modern and spacious Head Office for Westfield. Part of the requirements of the refurbishment works were to create specific facilities that promoted greater health and wellbeing for staff, such as a new wellbeing room, gym, recreational area and rooftop terrace. 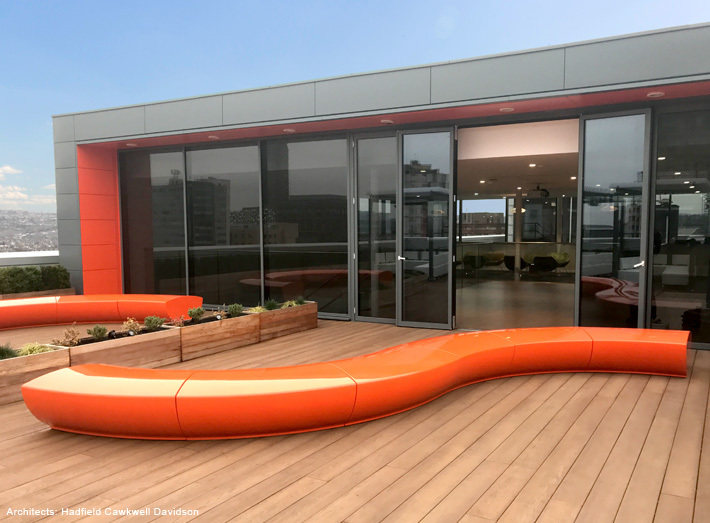 GeoMet's sleek and stylish Serpentine seating was specified for their contemporary rooftop terrace; an area to give staff fresh air, a quiet place for meetings, or relax in the sunshine and enjoy their lunch. Westfield Health and their architects, Hadfield Cawkwell Davidson, had searched high and low for suitable outdoor furniture to meet their needs. They wanted something in a zingy orange to complement Westfield's vibrant brand identity. The team at GeoMet were able to match the orange to the brand's exact RAL colour which provided the ideal solution. The Serpentine seating was also modular in construction and allowed the design team to create striking shapes to create special spaces that met with the roof terraces' needs. 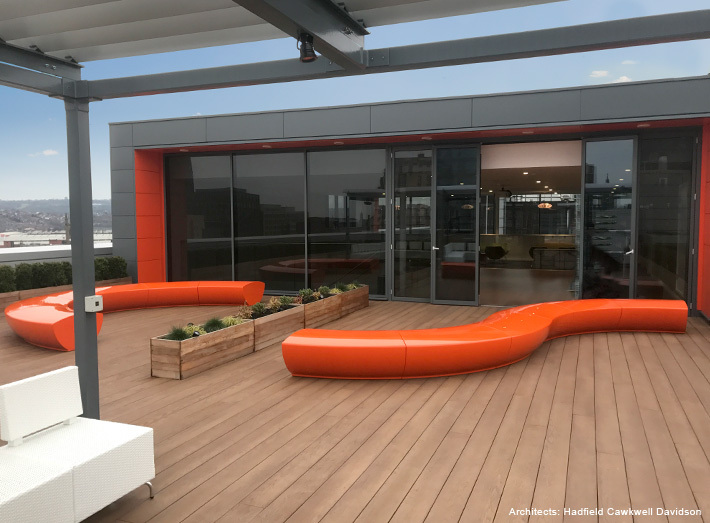 The rooftop project came with its own operational difficulties, such as installation, due to the height of the development, and health and safety requirements, to ensure the furniture would be safe in windy conditions. "The rooftop terrace is an exposed site so we needed a furniture solution which would resist wind uplift and movement. The rooftop terrace has a timber deck, which meant that bolting the furniture to the floor wasn't suitable. The team at GeoMet came up with the ideal solution which allowed each modular piece to be safely weighted, once placed in situ." 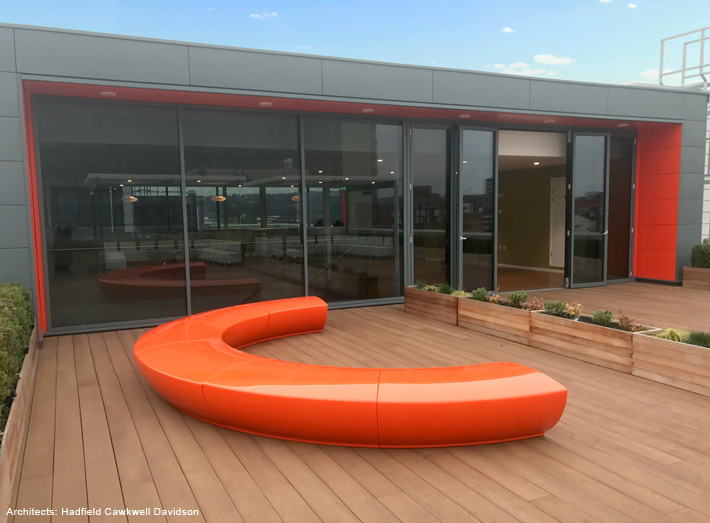 The rooftop terrace has now been used by Westfield Health for a number of company events and get-togethers, as well as a place for quiet contemplation, meetings or refreshment. "The terrace looks amazing and has become a wonderful place for staff to go. 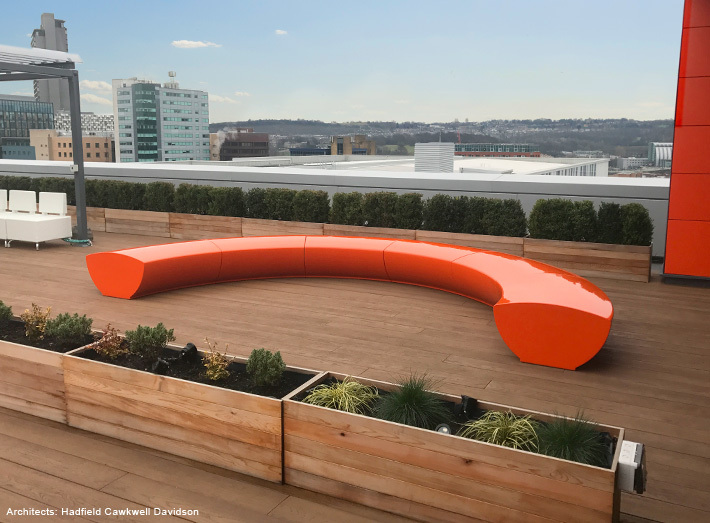 GeoMet were great at working with us to create a bespoke solution: the colour was exact to our requirements and they created a clever solution to install each seat into a rooftop location." A new wellbeing room, gym, recreational area and rooftop terrace were opened to promote greater health and wellbeing for staff. ...an area to give staff fresh air, a quiet place for meetings, or relax in the sunshine and enjoy their lunch. GeoMet were able to match the exact orange RAL colour to complement Westfield's vibrant brand identity. 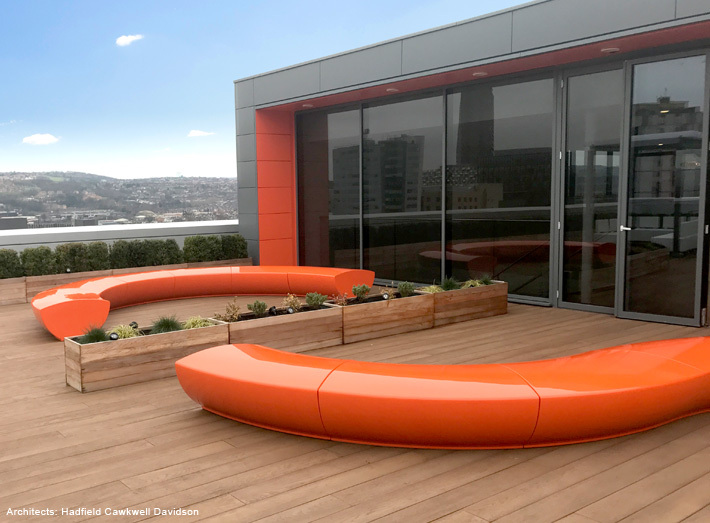 Serpentine seating is modular in construction and allowed the design team to create striking shapes to create special spaces that met with the roof terraces' needs. 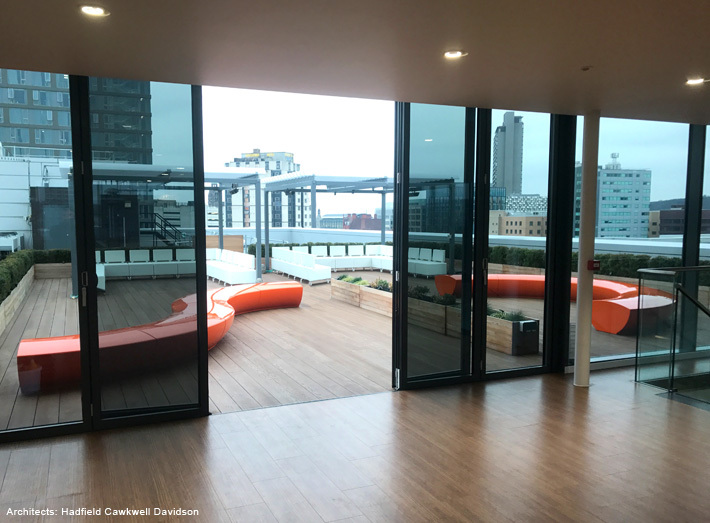 The rooftop terrace has now been used by Westfield Health for a number of company events and get-togethers, as well as a place for quiet contemplation, meetings or refreshment..